A teenage girl clashes with her new stepmother in this debut thriller with an unforgettable twist‘Dark, deep, thought-provoking . What a debut! I recommend you go and read it!’ Adele Parks‘Grips the reader with its twisty exploration of the complex relationship between step mother and step daughter’ Kate Hamer, author of The Girl in the Red Coat‘Oh so good’ Elle‘Told by two unforgettable female narrators, it's urgent, original and genuinely unputdownable’ Clare Fisher, author of All the Good Things‘Similar in spirit to We Need to Talk About Kevin’ Sunday Times‘Sure to be a reading group favourite’ Metro‘Stunning’ Laura Marshall, author of Friend Request‘Brilliant … the twists and turns left me reeling’ Eleanor Wasserberg, author of Foxlowe‘Dark, provocative and a refreshing take on the psychological thriller genre. 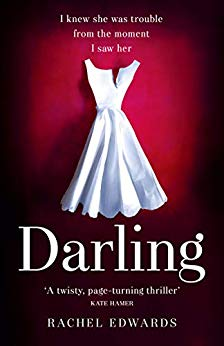 Darling and Lola are both brilliant creations’ Emma Curtis, author of One Little MistakeLola doesn’t particularly want a new stepmother. Especially not one who has come out of nowhere and only been with her dad for three weeks. And – she’s not racist or anything – but since when did her dad like black women anyway?Darling didn’t particularly want a new stepdaughter. Especially not one as spiteful and spoilt as Lola. She does want Lola’s dad though. And he wants her, so that’s that: Darling and Lola will just have to get used to each other.Unless Lola can find a way to get rid of Darling.